Fear. 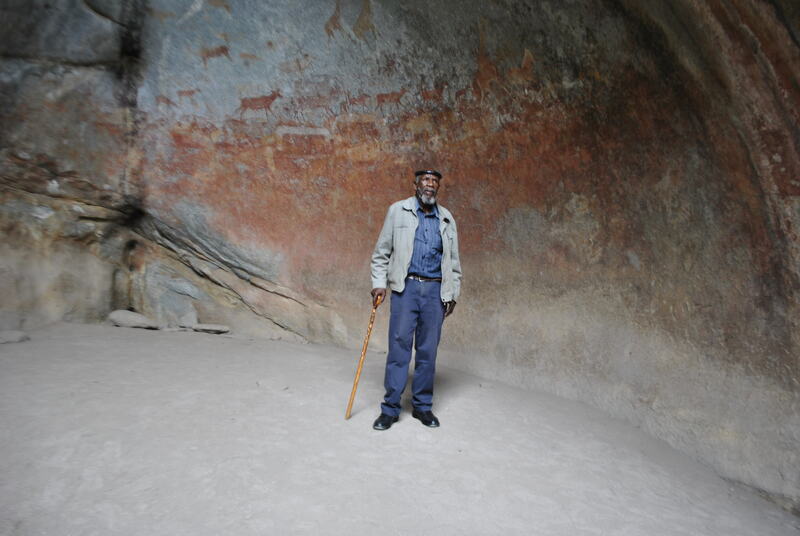 That was what a young David Ngwenya, now 82, felt when he first came face to face with one the world's greatest rock art collections, just steps from his childhood home in Matobo in Matabeleland South, Zimbabwe. 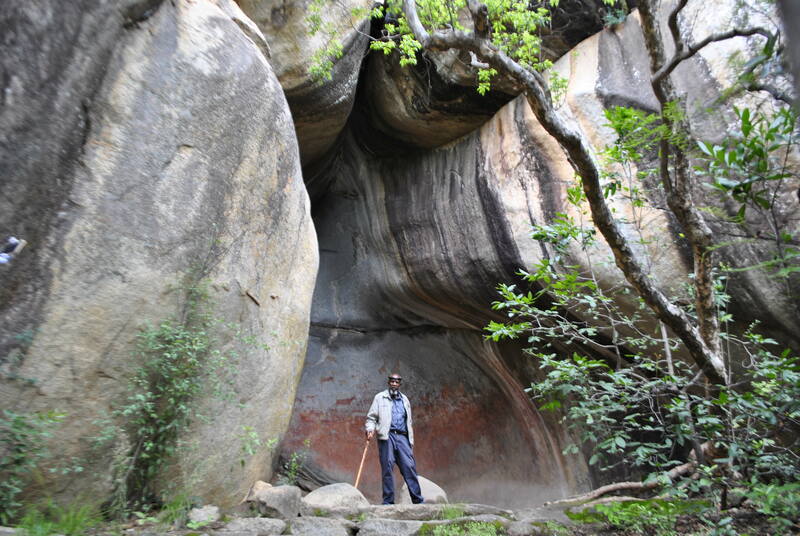 Today, David Ngwenya is a local steward of that art, fighting for the protection of sacred sites throughout Matobo Hills Cultural Landscape as they face new and acute manmade threats, including deforestation and vandalism. Matobo was included on the 2018 World Monuments Watch to help bring its challenges to an international stage. Ngwenya’s life is intimately attached to the rolling hills and granite rock formations that dot the landscape of Matobo. His great-grandparents established their home in an area of Matobo called Luma, where he was born in 1936. As a young man, he remembers hunting and shepherding cattle there. Luma is now part of the National Park, established in 1955. Matobo Hills mark critical stages in human history and evolution, reaching back 100,000 years. The first settlers were the hunter-gatherer San people, who created the rock art that is found throughout the landscape, in caves, cliffs, and boulders. “I have an ancestral tie to this site,” said Ngwenya. Ngwenya himself practices healing as a traditionalist. Many of his ceremonies take place at Matobo’s sacred sites. Last March, he held a thanksgiving ceremony for the keeper of Njelele, and in August, a rainmaking ceremony in preparation for the coming season. Ngwenya also mentors traditional healer apprentices and conducts initiation ceremonies at the sacred sites. Ngwenya says Matobo is regarded as one of the most highly respected spiritual centers not just within the country, but within the Southern African region as a whole. “We see this by the number of people who come from different parts of the country and other surrounding countries for religious purposes besides tourism,” he said. Ngwenya has witnessed decades of change at Matobo – chief among them, he says, the establishment of the National Park in 1955. Ngwenya recalls displacement of communities that reduced their grazing lands and ploughing fields, and eliminated their ability to hunt. Many of those who were forced to move, he said, were the keepers of Matobo’s sacred and spiritual places. The practice of traditional ancestral burial visits became difficult or impossible. Today, the ancient rock art of Matobo Hills is endangered. Ngwenya says this displacement could be to blame. Vandalism, graffiti, fires, and deforestation are jeopardizing Matobo’s sites. Trees that once formed a natural barrier to the caves are diminishing, leaving rock art prone to direct sunlight and rain. But Ngwenya says common ground can be found if the traditional leaders, local authorities, and heritage experts come together to address the issues. Awareness workshops, he said, could be a first step. In 1998, Ngwenya created the Cecil John Rhodes Ndebele Cultural Village – an exchange center to learn about other cultures while also sharing Matobo’s traditions, specifically for the benefit of younger generations. Ngwenya also hopes the center can generate market growth for the local communities through selling of cultural curios.